His unique style is so realistic, that it creates the mind-boggling illusion of making the viewers feel as though they are under the influence of a powerful hallucinogenic, like DMT or LSD. Grey is highly revered in the visionary art world, and has through the course of his career acquired a cult following for being a pioneer in reproducing visual archetypes of the psychedelic state of mind, a feat no other artist has been able to execute as superbly as he does. Luca: A psychedelic trip transformed your life, could you share the extent of the impact it had on you? Alex: The impact was a total reformatting of my psychic hard-drive. Back in 1975 I was a depressed 21 year old artist on my way to suicide. One morning I prayed to a God I did not believe in to show me a sign that I should continue my meaningless existence. Within 24 hours I had taken LSD for the first time and met the love of my life, the artist Allyson Grey. I went from an atheist to a mystic in a day. Your readers know, the miracle is in our midst. Psychedelics turn on people’s antennae for God consciousness. In the wake of our psychedelic journeys, my wife and I got the vision we needed to build a new kind of sacred space to house art that was based on the psychedelic mystical experience. So we co-founded a church and are building Entheon at CoSM, Chapel of Sacred Mirrors a retreat and cultural center in upstate New York, about an hour and a half away from New York City. 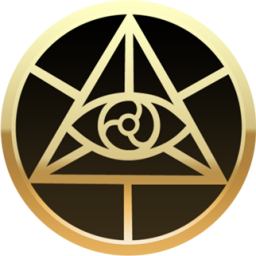 L: The Entheon is a novel project. What are its goals? 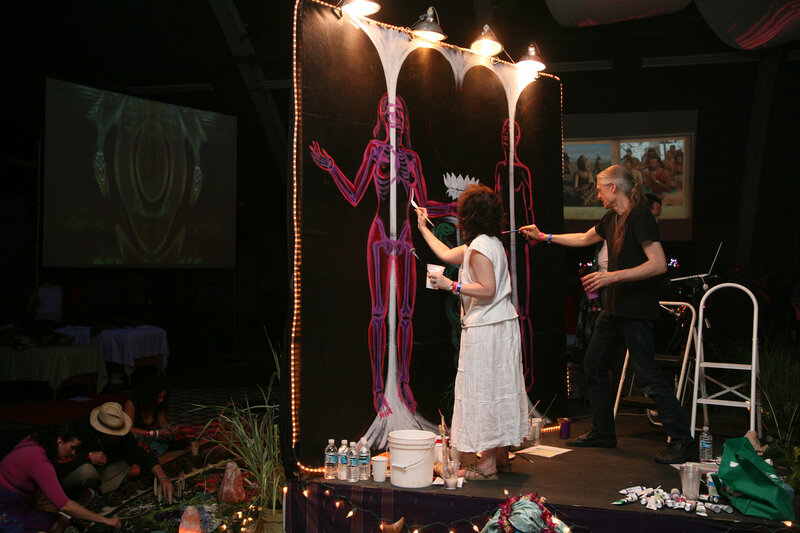 A: Entheon means a place to discover the God within, it will be the Sanctuary of Visionary Art at CoSM. Entering this elaborately sculpted building, the Narthex Gallery will feature annual rotating exhibitions of the worldwide visionary art movement, popular throughout festival culture. Entheon is a community based Art project. Entering this building surrounded with huge ornamental sculptures of interconnected faces bearing symbols of humanity’s wisdom traditions will generate the metaphor of symbolically walking into God’s head. The three-story high Entheon, now under construction, will exhibit the Sacred Mirrors, and the CoSM collection and include many unique psychedelic relics, like Albert Hofmann’s glasses, worn on April 19, 1943, the day the good doctor took the world’s first LSD trip, the lens through which he saw reality transform. L: Your brush technique is unique. What inspired you to paint in such a remarkable manner? A: The visions one sees in the mystic state are elaborate and ornate, I am only trying to point to these impossible-to-describe dimensions with a crude stick, hair and greasy pigment. Surprisingly, people who have journeyed there invariably understand. L: The definition of spirituality varies from soul to soul. What does it mean to you? A: Spirit, God, Primordial Transcendental awareness is the ground of all being and existence, yet is also outside of time. Spirit is infinite love and is the basis of creation. We are the scintilla, the living sparks of the cosmic creator. Evolution is in our hands as our creative life. Our true nature is timeless. I love all the great traditions, each has unique gifts with which to make God contact. L: You’ve called Ayahuasca, the “Green Jesus” can you tell us why? A: I’ve called ayahuasca the Green Mary too, because the Santo Daime and UDV churches are syncretic Christian churches. 2000 years ago, the first coming was when Jesus demonstrated the Divinity of Humanity, the second coming is NOW when the Green Jesus and Mary demonstrate the Divinity of Nature. If we do not live by that message and save the life-web, humanity will self-destruct. L: Do you consider DMT to be the ‘spirit molecule’? A: DMT opens us to the Divine Imagination, the only place to find God. Once you find God or Spirit within, then you see God everywhere, in everything, life becomes meaningful and filled with joyful work for God’s sake. We should not idolize the molecules or we will become idol-worshippers and miss the main event, God loves you and wants you to have an awesome life co-creating together. L: Who/what is your muse? A: Allyson Grey is my muse and my favorite artist and friend for many lifetimes. We celebrate 40 years together in love this year. I am so lucky. We have continued to journey throughout our time together and have both been inspired by the sacramental psychedelics. We believe the inevitable consequence of love is the building of temples. L: What other projects are you currently working on? A: I am always painting and imagining sculptures and architecture for our grounds here at CoSM. New products are being released on a regular basis, such as the Entheurn, for your ashes or your stashes. All of the sales from cosm.org CoSM Shop go toward building Entheon. Allyson and I have held full-moon ceremonies since January 2003, and every single month since. We started with friends in our Brooklyn loft, moving within months to Manhattan, and now upstate where we are building. Every month hundreds join with us, empowering each of our collective creative lives, praying together and raising awareness, support and money to complete and open Entheon for our global community. Humanity hungers for a righteous task. Building a temple is a righteous task. A: God is the Divine Artist and cosmos is the evolving masterpiece of Creation. 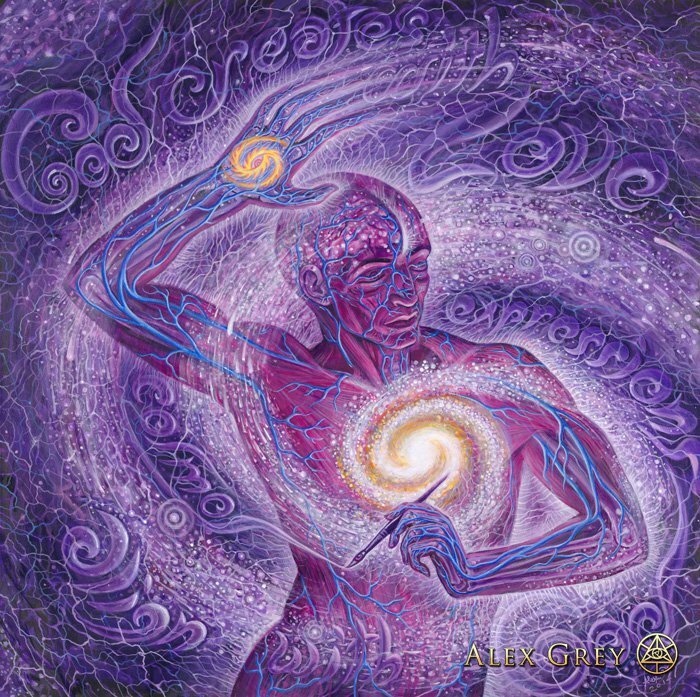 Visionary mystical experiences are humanity’s most direct contact with God and are the creative source of all sacred art and wisdom traditions. The best currently existing technology for sharing the mystic imaginal realms is a well-crafted artistic rendering by an eyewitness. 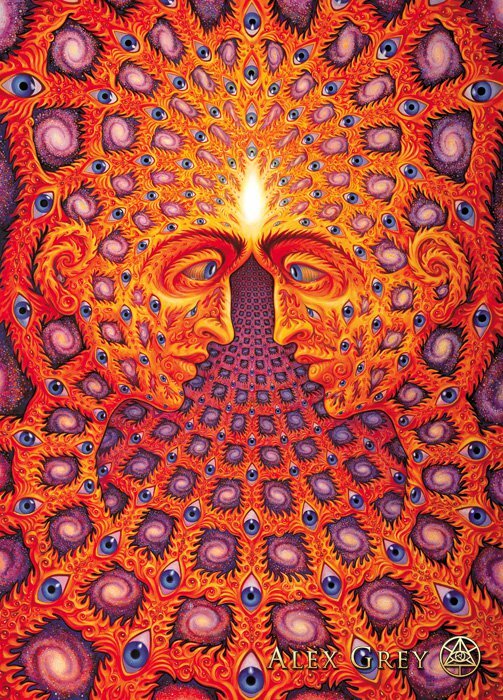 This is why Visionary Art matters.